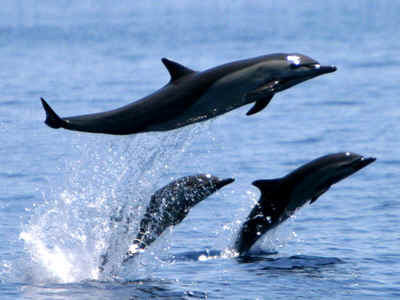 Costa Rica ecoholiday - ecotourism responsible travel / tourism. Ecotours, ecoholidays - ethicalescape! 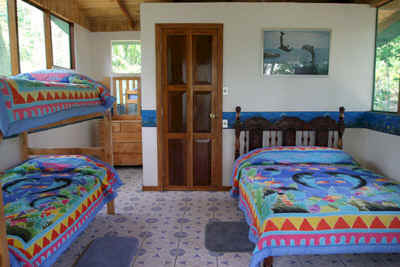 description: LOCATION, LOCATION, LOCATION: Delfin Amor Eco Lodge is located on the Osa Peninsula, which is on the Pacific (west) side of Costa Rica, on the southern most tip. The Osa Peninsula represents one of the first land formations that emerged in Central America. Due to the fact that the peninsula was an island in the past, it possesses unique endemic species of wildlife found no where else in the world in addition to migratory species from both North and South America. Drake Bay is named after Sir Francis Drake who legend has it, buried treasure here on the rich coast. You will meet monkeys, toucans, macaws, sloths, iguanas, blue morpho butterflies, poison dart frogs, sloths and all the creatures of the rainforest. 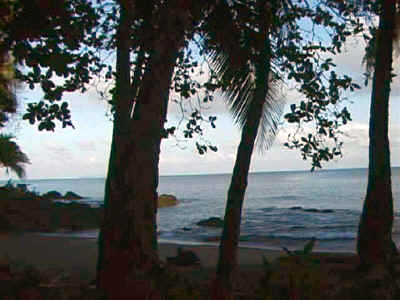 You will wake up to the sound of the howler monkeys and go to sleep to the sound of waves on the shore. The natural beauty found here is unsurpassed. accommodation: Eco does not have to be uncomfortable! Our private, tiled and screened cabinas offer stunning ocean and rainforest views, private bathrooms, warm showers and ceiling fans. Each cabina has a double bed and a bunk bed (two singles) and can sleep 2-4 persons. We have only six cabinas, keeping our lodge un-crowded and intimate. 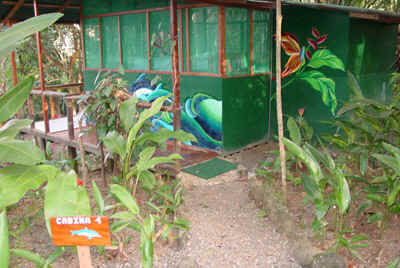 ecotourism: Delfin Amor Eco Lodge is devoted to sustainable and responsible eco tourism. We have a strong commitment to the local community and to the conservation and protection of the Drake Bay area, both on land and at sea. We recycle, use solar power when possible, compost, use planet friendly products and show our commitment to the environment in lots of different ways, including our monthly community newsletter. We are currently working with The Rainforest Alliance to become a part of their sustainable tourism program. We walk as lightly on the earth as we can! Fundación VidaMarina, researching and protecting the marine life here in the Drake Bay area, is based at Delfín Amor Eco Lodge and when you stay here, you have the opportunity to learn more about dolphins, whales, sea turtles and all marine life from our staff of marine biologists and volunteers. meals: Our commitment to the environment extends to our kitchen. Our meals are delicious and planet friendly, using only fresh fish caught by local fishermen, whole foods (almost nothing comes from a can! ), organic fruits and vegetables when possible and a super talented, creative chef! Vegan, Vegetarian and other special diets are happily accommodated, just let us know ahead of time. dolphin and whale ecotours: Our encounters with the wild dolphins and whales of Costa Rica are incredible as we have over 25 species of dolphins and whales that either live in the area or migrate through, including almost year round Humpback whales. We also encounter Pantropical Spotted Dolphins, Spinner Dolphins, Bottlenose Dolphins, Rough-Toothed Dolphins and Common Dolphins, Humpback Whales, Orcas, Pilot Whales, Sperm Whales, Sei Whales, Psuedo Orcas (False Killer Whales), giant manta rays, sea turtles and much, much more. It is a virtual marine playground! We often find ourselves surrounded by hundreds and even thousands of dolphins in our warm, clear, blue waters. You will learn about all you see from our marine biologists and expert guides. By joining our dolphin and whale eco tours, you are supporting our non-profit foundation, Vida Marina, in our goal to create a protected marine sanctuary in the area. 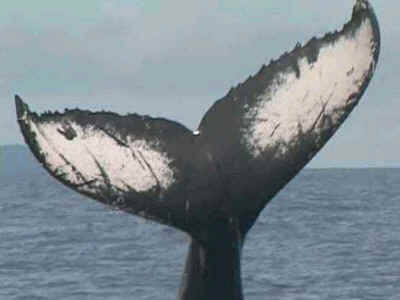 This is an amazing opportunity to see wild dolphins and whales in their natural environment. With Vida Marina's amazing research flying dingy (yes, a boat that flies!) finding the dolphins and whales is easy and fun! location: By Plane: Delfin Amor Eco Lodge is located on the Osa Peninsula in the Southern Pacific region of Costa Rica. Access to our resort is by boat only, there are no roads leading to the resort. We can arrange all transportation from the San Jose Airport to our resort and back for your departure. There are daily flights from San Jose to Drake Bay. Flight time is approximately 45 minutes and all flights depart San Jose only once a day, in the morning, either from the Juan Santamaria International Airport, where Sansa Airlines operates or from the smaller Pavas International Airport where Nature Air Airlines is located. Once in Drake Bay you will take a short taxi ride along the countryside to the small town of Agujitas, where you will board a boat for your trip across the bay to Delfin Amor Eco Lodge. Sansa Airlines; call in US 800-225-2272, in San Jose call 221-9414 or 442-5290. Nature Air Airlines has scheduled daily flights from the Pavas Airport (about 15 minutes out of San Jose), call in San Jose 220-3052, or go to their website at NatureAir.com to make your reservations online. By Bus: If you want to travel to us by bus, you need to take the 5:30 am bus from the Coca-Cola Station in San Jose to Palmar Norte. From Palmar Norte, you need to take a taxi to Sierpe. This will get you to Sierpe by 11:00 am or so. You then take a boat to Drake Bay (about an hour's ride down the river), $20 per person. The boats all leave between 11:00 and 11:30 am for Drake Bay, and there is no guarantee there will be space for you. It is best to arrange this boat through us ahead of time to guarantee your space. By Car: From San Jose take the Inter-American Highway south to Palmar Norte (about six to seven hours). Turn off in Palmar Norte towards Palmar Sur, after the bridge make a right and then continue on to Sierpe. You then take a boat to Drake Bay (about an hour's ride down the river), $20 per person. The boats all leave between 11:00 and 11:30 am for Drake Bay. It is best to arrange this boat through us ahead of time to guarantee your space.